Boeing Delivers 10,000th 737 Family to Customer. 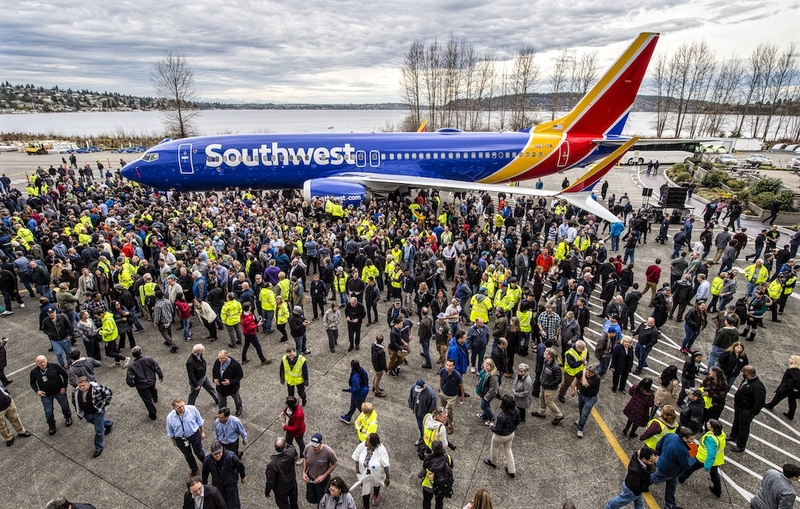 Boeing has launched the aircraft that represents the 10,000 737 assembled in the Seattle area since 1967, a 737 Max 8 in the Southwest Airlines livery. The aircraft, registered as N8717M with serial number 42571, will be delivered to the low-cost carrier based in Dallas later this month. The historic rollout came with the 737 certification as the "largest commercial jet produced" by Guinness World Records, Boeing says in a tweeted statement. The closest rival to the 737 - the Airbus A320 family 20 years younger - had registered 8,029 deliveries until February 28, according to the Airbus website. "Today we are celebrating the 10,000 737 delivery where the family is built in the world's most efficient single-aisle aircraft production plant," Boeing says in a tweet. Boeing launched the final assembly of the first 737 at Boeing Field in Seattle, then moved the program to the south shore of Lake Washington in Renton in the early 1970s. The 10,000th launch event occurs a week after the unpainted 737 left the final assembly line. Boeing joins the 737 and builds the wings in Renton. The fuselage is assembled by Spirit AeroSystems in Wichita and sent by train to Seattle. CFM International supplies the engines - CFM56 for the 737NG series, and Leap-1B for the 737 Max - for plants in the United States and France.